Getting ink onto paper takes planning and preparation and teamwork. Finding the best production method for your project is critical to the success of your communication piece. Contact your Account Manager for an initial consultation and to explore your best options. Frequently, files to print from are supplied by the customer. We recommend that you review our Print-Ready Guidelines (PDF). 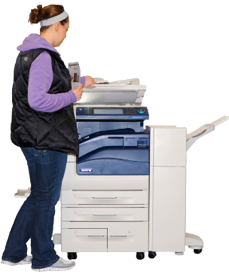 If you need help with creating print ready files, Creative Communication’s prepress department or design team can help you with your file preparation and offer suggestions to enhance your project’s printing quality. Before your project is printed, a proof is created for your review. Proofs may be electronic (PDF) or hard copy. To ensure content accuracy, design intention and that color will print as expected, careful proofing is a critical step in the process. After you and your team have approved the proof, your project is off to print. A print project does not end simply with the application of ink to paper. The piece must also be trimmed, bound, scored, and folded, depending on your project specifications. Regardless of the size of your project, your Account Manager is here to help you navigate the printing process and get the best value and product for your printing dollar.